DingPost is a web-based social media marketing PHP script that runs on your own host, both shared host or VPS/server to build an online business social media platform to help your clients publish auto posts, schedule posts to Facebook, Twitter, Google+, LinkedIn, Instagram and many more. 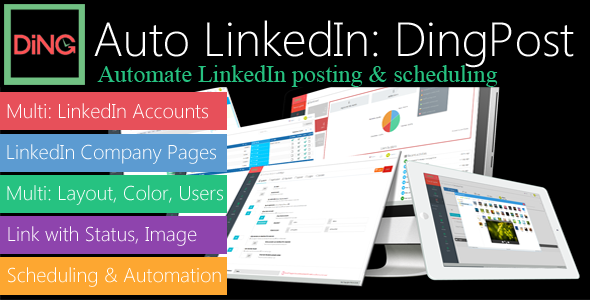 DingPost: Business is a set of powerful tools that allow your clients to manage multiple social networks, scheduled posts, instant posts for increasing traffic and engage your audiences easily and rapidly without any skills of web design, coding or programming. DingPost: Business + Resell Solutions may offer your loyal cilents the best solutions & amazing powerful tools to run their own online business on your platform to charge their users for using the services. They may organize & charge end users with their own fees & plans. Note: this software using the official Social Media API (Facebook, Twitter, Instagram etc) which is available on Developer Center and from third parties and/or services. Therefore, we are not responsible if they made too many critical changes in their side. We also don’t guarantee that the compatibility of the software with Socia Media API will be forever; although we will always try to update the lastest version of script as soon as possible.